HÀ NỘI — Việt Nam set up a rematch with Thailand in the final of the Southeast Asian Women’s Football Championship, defeating hosts Myanmar 5-4 in the penalty shootout yesterday in Mandalay City. 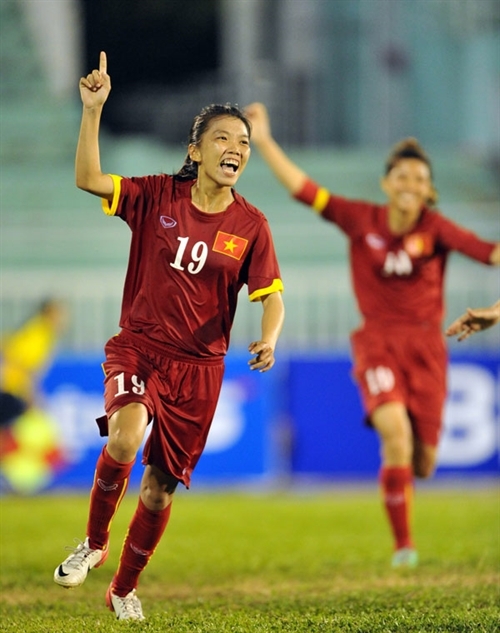 Vietnamese players were successful with all their kicks, while Myanmar captain Khin Moe Wai could not beat goalkeeper Đặng Thị Kiều Trinh in their third shoot. Earlier, in the 90 official minutes of the semi-final match, the two sides drew 3-3 with both enjoying a penalty each. Huỳnh Như opened the score the Việt Nam at the 15th mark, sending a ball to the net after her teammate Nguyễn Thị Tuyết Dung’s kick hit the bar and bounced back to Như. Dung then scored her own goal just two minutes later with a straight slow shot. With the support of more than 30,000 home fans, Myanmar found their touch in the second half and went ahead with three goals. In the last second, Việt Nam received a penalty when Như broke into the box and was faulted by Myanmar goalie. Captain Nguyễn Thị Minh Nguyệt, who is playing her last international competition, made it 3-3. Myanmar fans became angry with the referee crew’s decision and ran onto the ground to attack them, leading to chaotic scenes. It needed some 30 minutes to resolve the issue before two teams played the extra time which ended without a goal being scored. In the first semi-final match, Thailand came from behind to beat the Australian U-20 squad 2-1 for the final berth. Australia went ahead with an opener by Grace Maree Tenison Maher just 10 minutes from the start after a counter-attack. Kanjana Sung-ngoen needed 20 minutes to find the equaliser for the defending champions. It was 2-1 for Thailand near the end of the first half with a penalty shoot-out. Orathai Srimanee made no mistake while increasing the score. Today is a rest day. The matches will resume tomorrow at Mandalarthiri Stadium. In the group round match last week, Việt Nam won 2-0 over Thailand. defeating hosts Myanmar 5-4 in the penalty shootout yesterday in Mandalay City.